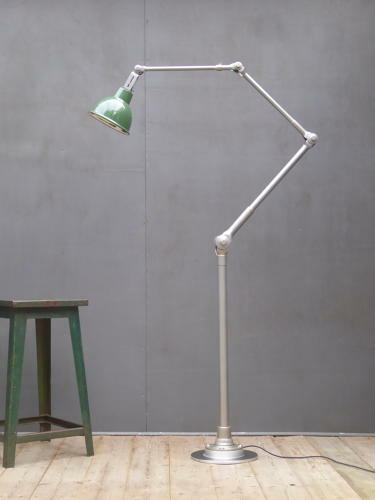 An original vintage industrial Dugdills floor lamp of monumental proportions. A fantastic oversized articulated lamp in a stripped steel finish with a contrasting green & white enamel shade and cast iron base. The height is almost twice that of a standard Dugdills lamp & the tubing is of a far thicker gauge making this is the largest one we've come across to date & a real rarity! Rewired in twisted black flex & mounted on a fitting cast iron disk for added stability. Wear commensurate with age, excellent, fully restored condition with some loss to the inner enamel shade & a small hole in tghe underside of one arm which would have housed a bolt originally, neither of which detract in the slightest (see last two pics). In the first image the lamp stands around 150cm in height (around 225cm flat out). UK courier service available at £18 tracked & signed for 24 hour delivery. All electrical items should be checked and / or installed by a qualified electrician prior to use.